Download "Gowrie South Australia. 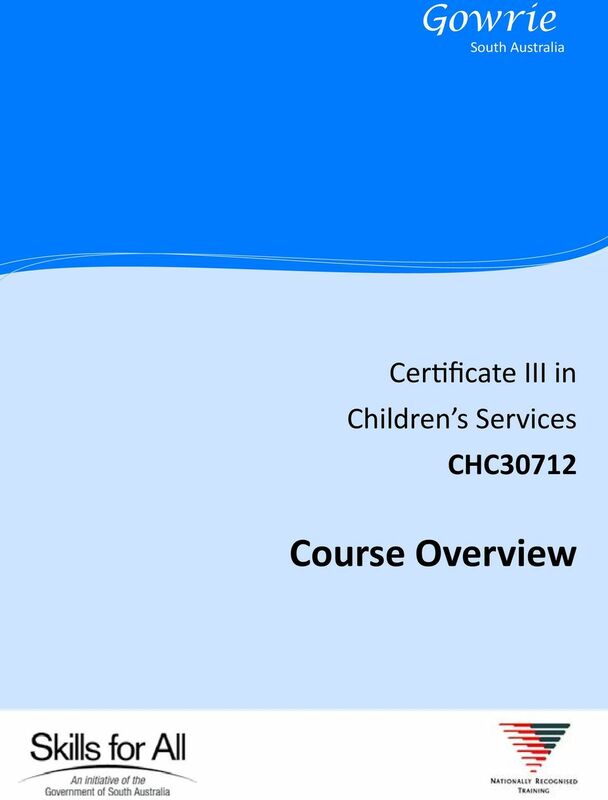 Certificate III in Children s Services CHC30712. Course Overview"
2 Certificate III in Children s Services One of the key changes with the introduction of the National Quality Framework (NQF) is to have more qualified educators. All educators working in child care or preschool services will need to have (or have completed units of study towards) a minimum of Certificate III in Children s Services by 1 January Gowrie SA encourages learners from culturally and linguistically diverse backgrounds including Aboriginal and Torres Strait Islander learners to apply. 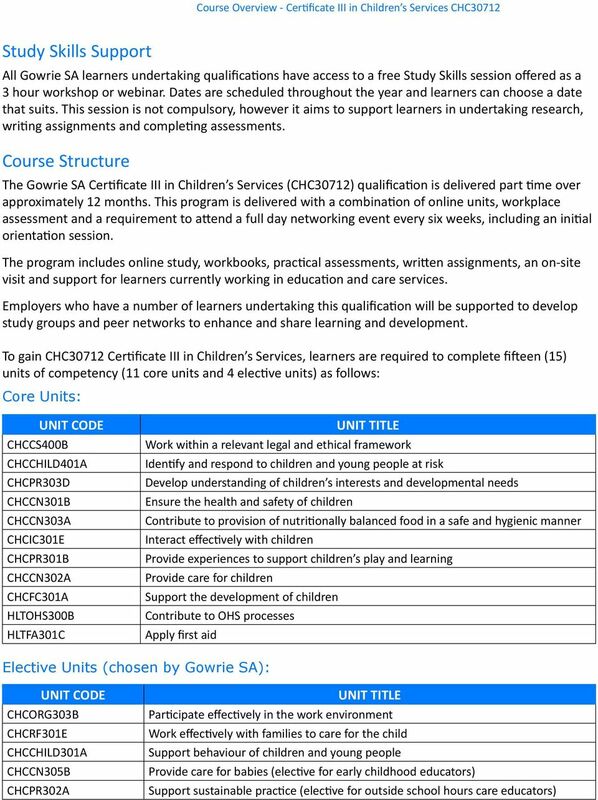 Gowrie SA also supports learners with a disability to access this course. Entry Requirements There are no entry requirements to undertake this qualification. 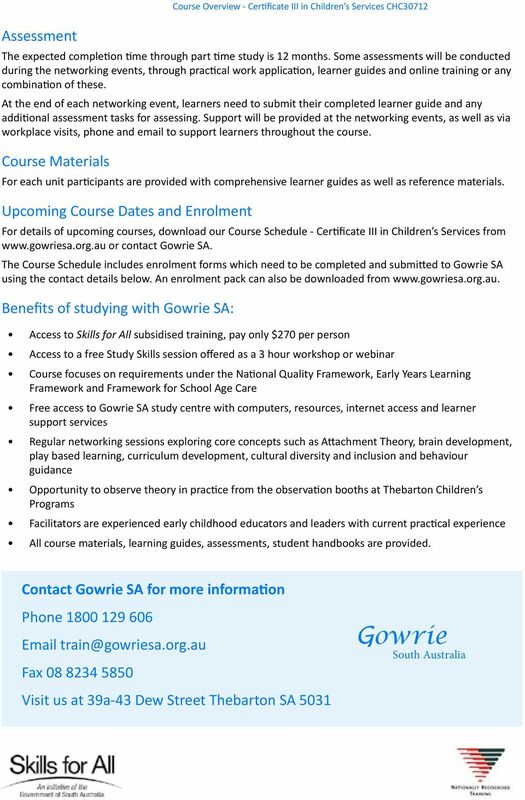 Gowrie SA currently delivers Certificate III in Children s Services to existing educators who are currently working or volunteering within children s services setting. This could include long day care, family day care, outside school hours care, student support officer, early childhood worker, creche worker, etc. Career Pathways Career pathways include early childhood educator, playgroup supervisor, *outside school hours care educator, family day care educator, childhood educator, childhood educator assistant, mobile assistant, nanny or *recreation assistant. (*some jurisdictions may required CHC41208 Certificate IV in Children s Services (Outside School Hours Care) for these work roles. Recognition of Prior Learning In recognition of current experience, learners can apply for Recognition of Prior Learning (RPL) and Credit Transfers. An individual learning plan will be developed for each learner identifying RPL and Credit Transfer options and gap training required. Course Fees & Traineeship Incentives Course fees for students is only $270 with training subsidised by the Government of South Australia s Skills for All initiative. There is also a requirement to undertake First Aid Training for learners who do not already have this certification which is at an additional cost to the learner. 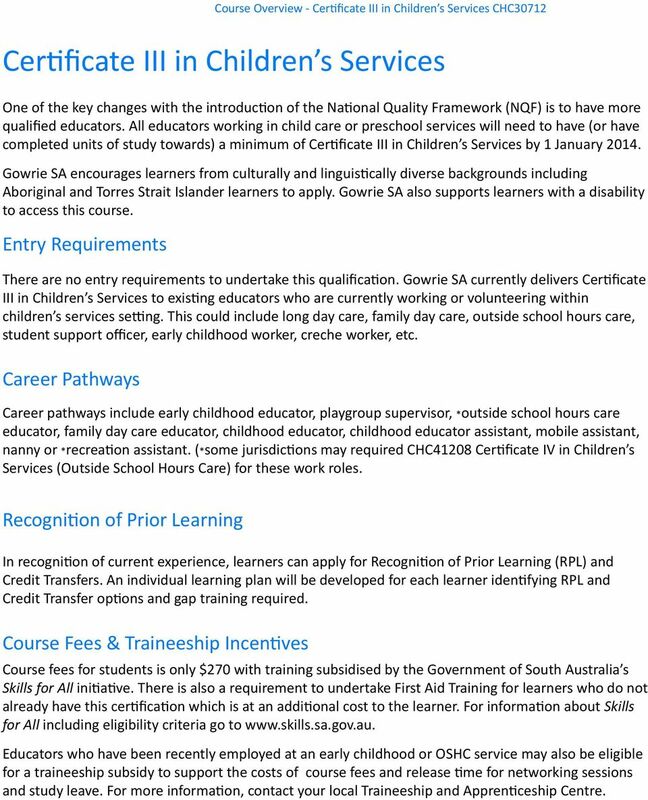 For information about Skills for All including eligibility criteria go to Educators who have been recently employed at an early childhood or OSHC service may also be eligible for a traineeship subsidy to support the costs of course fees and release time for networking sessions and study leave. For more information, contact your local Traineeship and Apprenticeship Centre. 4 INDICATIVE ALLOCATION OF HOURS PER UNIT UNIT Total hours per unit Learner Guide Networking Events Assessment Workplace Work within a relevant legal and ethical framework (C) Identify and respond to children and young people at risk (C) Participate effectively in the work environment (E) Ensure the health and safety of children Contribute to provision of nutritionally balanced food in a safe and hygienic manner Interact effectively with children Support behaviour of children and young people Work effectively with families to care for the child Support the development of children Provide care for children Provide experiences to support children's play and learning Provide care for babies Develop understanding of children's interests and developmental needs Support sustainable practice Apply first aid Contribute to OHS processes Total hours 573 Delivery Methods Gowrie SA has integrated all learning and assessment activities, bringing together a number of units that reflect real sector outcomes and processes. As all learners will be working or volunteering within an education and care environment, the assessments and activities will be linked to requirements in their current role and will support enhancing their practice. A significant aspect of this qualification is implementing concepts explored within the workplace. Attendance Requirements To meet assessment requirements of this qualification, a minimum of 80% attendance is required at all networking events.